The Japanese H-II Transfer Vehicle-3 (HTV-3) resupply spacecraft has departed – via an abort burn – from the International Space Station (ISS) following a nearly one and a half-month berthed mission. After unberthing from the ISS at around 11:50 AM GMT, release from the station’s robotic arm came at 3:50 PM GMT, following which HTV-3 departed – at speed – via the abort burn. HTV-3 was launched atop a Japanese H-IIB booster from the Tanegashima space center on July 20, 2012, and following a weeklong catch-up flight, was captured by the ISS’ Space Station Remote Manipulator System (SSRMS) and berthed to the Node 2 Nadir port on July 27. Once ingress into HTV-3’s Pressurised Logistics Carrier (PLC) was completed the following day, the process of unloading HTV-3’s internal cargo got underway, which saw a large load of 224 Cargo Transfer Bag Equivalent (CTBE) of cargo transferred to the ISS, with station trash loaded into HTV-3 in place of the transferred cargo. 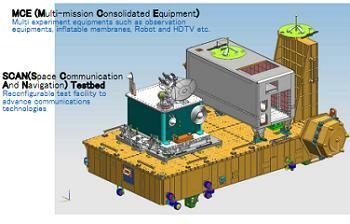 In addition to science hardware, replacement parts, and crew support items, some of the more notable payloads aboard HTV-3 were the ISS SERVIR Environmental Research and Visualization System (ISERV), a modified commercial telescope that will perform disaster monitoring from the ISS, once it is installed in the Window Observational Research Facility (WORF) rack in November. In addition to ISERV, the Multi Purpose Experiment Platform (MPEP) and JEM-Small Satellite Orbital Deployers (J-SSODs) were transferred to the ISS. The J-SSODs will be loaded with CubeSats, also delivered on HTV-3, and mounted to the MPEP, whereupon the entire assembly will be transferred outside the ISS via the JEM (Japanese Experiment Module) airlock, following which it will be grappled by the JEM RMS, aimed in a nadir-aft direction, and the CubeSats will then be released from the J-SSODs via springs. The Aquatic Habitat (AQH) was also transferred to the ISS, which, when installed in the Japanese Multipurpose Small Payload Rack (MSPR), will provide a habitat for Medaka fish aboard the ISS, aiding research into how fish born in space will react and adapt to the microgravity environment. 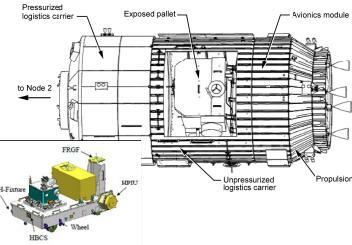 Some very valuable external research cargo was also transferred to the ISS during HTV-3’s berthed mission, via HTV-3’s Exposed Pallet (EP) which resides in the Unpressurised Logistics Carrier (ULC) section of the HTV. Following EP extraction from the ULC by the SSRMS and hand-off to the JEM RMS, the EP was installed onto the Japanese Exposed Facility (JEF) to await removal of its cargo. On the second day of EP operations, the Special Purpose Dextrous Manipulator (Dextre) on the end of the SSRMS grappled and removed the Space Communications and Navigation Testbed (SCaN TB) payload from the EP. 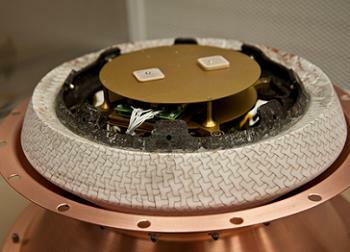 It was then transferred and installed it onto an ExPrESS Logistics Carrier-3 (ELC-3) Passive Flight Releasable Attachment Mechanism (PFRAM) interface, where the SCaN TB will support research into re-programmable Software Defined Radios (SDRs) in space. On the fourth day of EP operations, the JEM RMS grappled and removed the Multi-mission Consolidated Equipment (MCE) payload from the EP and installed it onto the JEF. The MCE contains an assortment of experiments including robotics, inflatable structures in space, lightning monitoring, and commercial HD video cameras. The fifth and final day of operations saw the JEM RMS remove the then empty EP from the JEF and hand it back to the SSRMS, which then re-inserted the EP back into the HTV-3 ULC. 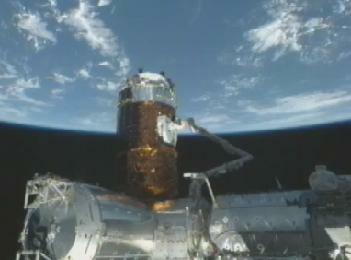 In addition to the heavy workload of cargo activities, HTV-3 was also present at the ISS for two US spacewalks (EVA-18 and EVA-19), as evidenced by a stunning wide-angle photo taken – but unreleased – during US EVA-18, showing the entire ISS with HTV-3 attached, available to download on L2 – LINK. With HTV-3’s cargo fully transferred and trash items loaded into its place, the Common Berthing Mechanism (CBM) hatches between HTV-3 and the ISS were closed on September 11, in preparation for HTV-3 departure from the station on September 12. Following CBM vestibule depressurisation and removal of all 16 CBM bolts (in four stages of four bolts), HTV-3 was unberthed from the ISS with the SSRMS on the morning of September 12 at approximately 11:50 AM GMT. Over the next few hours, the SSRMS manoeuvred HTV-3 to the release position around 30 feet below the ISS, following which, with both ISS and HTV-3 thruster inhibited, the SSRMS ungrappled HTV-3 at 3:50 PM GMT, signifying its release from the ISS. After a period of 90 seconds, the ISS crew sent the retreat command to HTV-3, which initiated the departure sequence burns. However, despite the departure appearing to be on time, the velocity was far greater than the eight feet per minute, as outlined by the PAO commentating on NASA TV. 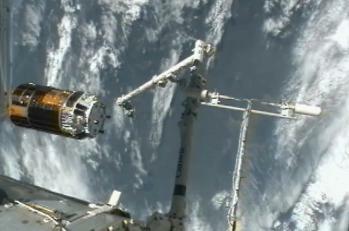 Within five minutes, the HTV-3 was a 1000 feet in front of the ISS. Sources claim the speedy depature was off-nominal, due to the vehicle carrying out an abort burn slightly ahead of the scheduled departure burn. However, this has yet to be confirmed by either NASA or JAXA, and no reason has been given for what caused the off-nominal condition. In total – per the timeline – four departure burns were called for, known as ISS Departure Maneuver (IDM) -1 and -2, followed by Descending Maneuver (DSM) -1 and -2, following which ISS and HTV-3 integrated operations officially ended. ISS camera coverage of HTV-3’s unberthing was visibly grainy at some times, since the SSRMS end B Camera Light Pan/tilt Assembly (CLPA), which was replaced during US EVA-19 due to a focus issue, was noted to have a “white haze and halo effect” during checkout. 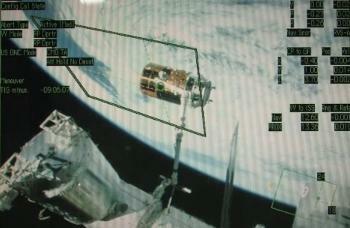 According to L2 information, “the SSRMS Boom B Camera was powered on during [HTV-3] operations and continues to provide hazy images. The camera performance is sufficient to meet the requirements for HTV-3 unberthing”. The Canadian Space Agency (CSA) continues to investigate the issue. Approximately two days after release, HTV-3 will conduct a series of de-orbit burns for a destructive re-entry over the Pacific Ocean. HTV-3’s scientific utility will continue even after its destruction however, since two re-entry payloads are stowed inside HTV-3 to gather data to compare to computer models, in order to improve knowledge of re-entry characteristics. The first of these payloads is the Re-Entry Breakup Recorder (REBR), which is designed to gather data on spacecraft destruction/break-up and transmit it back to Earth. A REBR successfully gathered data during the HTV-2 re-entry in March 2011, even surviving the experience intact after landing in the ocean, however the REBR that rode with Europe’s ATV-2 during its re-entry in June 2011 failed to gather data. The second re-entry payload inside HTV-3 is the Japanese-built i-Ball, which will record actual video footage of the HTV-3 break-up and disintegration, prior to parachuting to a landing in the Pacific Ocean for recovery and extraction of the on-board video data. (Images via L2, JAXA and NASA). (NSF and L2 are providing full high level space flight coverage, available no where else on the internet, from Orion and SLS to ISS and COTS/CRS/CCDEV, to European, Japanese and Russian vehicles).